Natively supported by most modern games. The Play & Charge Cable does not work for connecting a wireless controller; it is only for charging. The Xbox 360 Chatpad is not natively supported; use the Chatpad Super Driver (wired controllers only). The controller/receiver should be automatically detected on Windows Vista and later. If it is not detected or you are using Windows XP install the Xbox 360 Accessories Software (for both wired and wireless controllers). Use the TattieBogle OS X Driver. This controller is "Plug and Play" on most distributions of Linux. Xboxdrv is an alternative to the stock driver and allows many configuration options. The Xbox Support website has multiple support pages on using the Xbox 360 Controller with Windows. "Using the Xbox 360 controller for Windows"
"Troubleshoot your Xbox 360 controller for Windows"
"Set up your Xbox 360 controller for Windows"
"Xbox 360 Wireless Gaming Receiver for Windows"
"Configure your Xbox 360 controller for Windows"
See XInput Plus. Some games may still not support vibration even with this installed. 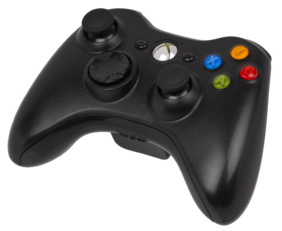 The Xbox 360 Controller for Windows has a well-known limitation, namely you can't turn it off with the GUIDE button, except in Games for Windows Live games. The receiver doesn't work in a USB 3.0 or 1.1 port, only use it in a USB 2.0 port. A very common issue where the Microsoft Wireless Receiver suddenly fails and stops working. Best guide to follow for this procedure. If you experience input errors from the d-pad, following this procedure might fix it. This is usually caused by using a knock-off receiver; the official Wireless Gaming Receiver is never sold separately. Download the and install the Xbox 360 Accessories Software. Windows 8: Right click the Start corner or press ⊞ Win+X, choose Device Manager. Vista and 7: Open the Start menu, type devmgmt.msc press ↵ Enter. Right click on the Unidentified Device and choose Properties. On the Driver tab click Update driver. Choose Let me pick from a list of device drivers on my computer. Choose Microsoft Common Controller for Windows Class. If a warning appears, choose Yes. The wireless controller can now be connected by holding the central Guide button until it starts flashing. Displays a battery meter for connected XInput controller devices in the Windows taskbar. This page was last edited on 24 March 2018, at 17:44.